Three keys to how this Finnish billionaire grew his fortune, and how it can help any investor find great investments. With an estimated net worth of $3.2 billion, Antti Herlin is the richest man in Finland -- and he's also one of the luckiest. It was his great grandfather that acquired KONE in 1924 – currently a world leader in designing and manufacturing elevators and escalators. His grandfather diversified the business by producing industrial cranes, which helped it survive the great depression. And it was Antti's father who acquired ASEA's elevator business, which turned KONE into an overnight market leader in Northern Europe. Despite the intelligent moves made over the decades, KONE struggled in the 1990s and was forced to sell off the crane portion of the business. So, while Antti Herlin may have inherited the family business, it was his job to take the company into the 21st century -- and he did it in a big way by investing in research and development, focusing on emerging markets, and hiring management with vision. I believe by following Herlin's three keys to success, investors can find some of the best available investments today. For the better half of the 20th century, there were two types of elevators: hydraulic and geared traction. Hydraulic elevators pushed from below, and traction pulled from above. While both worked, they came with a few significant drawbacks: They needed machine rooms, they were slow, loud, had large motors, and the hydraulic systems required tons of oil. By implementing new technology in 1996, KONE was able to develop the gearless traction elevator. This was not only the first elevator that didn't require a machine room, but it substantially improved all of the shortfalls of older models. The innovation launched KONE to the top of its industry. Since then, KONE has continued to innovate new technology to enhance energy efficiency through a commitment to R&D spending. Key takeaway: Look for businesses that commit to developing and innovating their products and brands, and have the ability to turn their investments into sales. 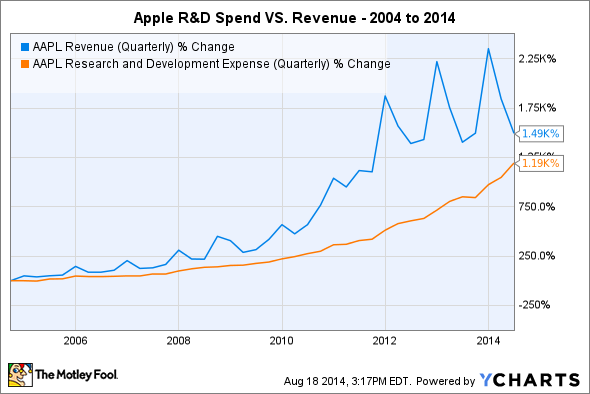 Example company: Over the past decade, Apple's revenue is up nearly 1,500%. In the same time, the company's R&D spending is up nearly as much, which has allowed Apple to continue developing innovative technologies. Between 2002 and 2004, Herlin saw the opportunity rapidly expand in the fastest growing regions of the world -- this included: China, India, Russia, and the Middle East. Asia-Pacific specifically turned out to be one of KONE's biggest opportunities for growth. In 2005, the Asia-Pacific region accounted for roughly 12% of KONE's elevator and escalator sales, and today, it's a whopping 38%. Key takeaway: KONE's patented technology could work anywhere in the world, and it has allowed the company to grow for nearly a century. When looking for great investments, find companies with a business model that can work everywhere. Example company: At the end of 2013, 94% of Under Armour's sales were in North America. However, considering people love sports all over the world, the company's business model of marketing their branded apparel through famous athletes could theoretically work anywhere. Antti Herlin is unquestionably a shrewd businessman. This was best shown by his acquisition of a beaten-down Finnish conglomerate -- involved in industrial cranes and material handling -- in 2002. A business that would be spun off to create Cargotec just a few years later. While the acquisition worked out well, it was a distraction that took the business away from its core strategy -- and led to KONE falling behind industry competitors. Herlin resigned as CEO in 2006, but held his position as a board member, and Matti Alahuhta took over and created a clearer vision for the company's future. That vision was, and still is today: "KONE delivers the best People Flow experience." This means focusing on giving customers what they need, energy efficiency, a passion for making the best products, and winner together -- or being a unified company that people enjoy working for. Key takeaway: As a board member, Herlin helped bring in someone with big vision. The best investments are in companies that have a clear and understandable mission that you believe in and they follow through on. Example company: Led by CEO Howard Schultz, Starbucks believes in making quality coffee with ethically sourced beans, being a company that takes care of its employees and creates stores that become a part of their communities and allow an escape for customers. This is not only a mission that's easy to believe in, but one the company follows through on.